We offer student-guided tours by appointment between 9:00 a.m. and 4:00 p.m., Monday - Friday. In order that we may arrange a guide, please submit your request at least one week prior to your visit. We also offer the option of a self-guided tour that you can do at your convenience. With advance notice, we can usually accommodate a meeting with the department Undergraduate Advisor to discuss the program and answer questions. The Office of Admissions offers visitors regular tours of campus. Walk with a current student on a campus tour and see the UCSB library, a residence hall, the University Center and more. Get a student perspective of campus and residential life. Tours run Monday through Friday (except major holidays) 11:00 AM and 2:00 PM starting at the Visitor Center. Campus tours are offered on Saturdays in the months of April and May. If you would like to visit on another Saturday, Sunday, or holiday, you may take a Self-Guided Tour Map and tour the campus on your own (available online and in print outside of the Visitor Center). For more info about tours and to register for a campus visit, visit UCSB Campus Tours and Presentations. The Hatlen Theater has a large proscenium stage with an attractive wood paneled auditorium seating 340 people. The hydraulically operated forestage extends the width of the proscenium and serves as an apron to the stage, an extension of the auditorium floor, or an orchestra pit. The lighting system is computer operated. The Studio Theater is a laboratory theatre used for acting and directing classes as well as for student directed plays and projects. 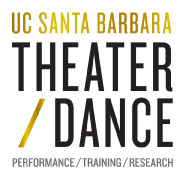 Opened in 1996, the intimate Performing Arts Theater is a "black box" theatre designed for flexibility with seating and staging configurations such as thrust, arena, or open end. The audience capacity varies between 85 and 130 people. The theatre has state of the art computerized lighting and sound systems. The support areas for the theaters and dance studios include rehearsal rooms, fully equipped and staffed scenery and costume shops, laundry and dye room facilities, dressing rooms, and various storage and office facilities.